an ink -removal technique developed by researchers at the University of Florida, usa, has opened the doors for the paper industry to reduce the chopping of trees and enhance profits by recycling more types of paper cheaply. The technique removes inks, pigments and dyes from many types of paper -- newsprint, glossy magazines, even tissue -- while increasing the amount of recycled paper that plants can use to produce new paper. 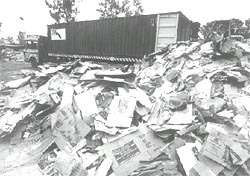 Methods currently used typically result in a finished product that is inferior to the original -- newspaper stock, for example, often gets recycled into cardboard -- while the new technique produces paper nearly the same quality as the virgin stock. "From an ecological perspective, there is considerable need both to conserve forests and preserve landfill space, but recycling paper is usually more expensive than producing new paper from wood," says Hassan El-Shall of the University of Florida. "By making the process more economical and effective, our method may provide a solution." The first step in the conventional paper recycling process is to mix the original paper with water to produce paper pulp, says El-Shall. Recycling plants also increase the alkalinity of the mixture and add a class of chemicals known as surfactants, which absorb the ink particles. They transfer the pulp into a flotation machine, where an impeller stirs the mixture and draws in air to create bubbles. Sometimes augmented with compressed air, the surfactant-coated ink particles attach to the bubbles and rise to the top of the tank. In many cases, the plant operator adds other surfactants to turn the bubbles into foam. The final step in the process is for the foam-carrying ink to be skimmed off and the resulting white pulp is transformed into paper. The new technique replaces the surfactants, which are costly, with a blend of cheaper chemicals. The chemicals mix with the paper fibre and create their own air bubbles -- eliminating the need for compressed air -- which release the ink from the paper and carry it to the surface to be skimmed off. El-Shall says that though the technique has not yet been tested in the industrial setting of a pilot recycling plant, laboratory have been very promising. The blend of chemicals is not only more effective with a broader variety of paper stocks than the surfactants, it also nearly doubles the amount of recycled paper that can be used to produce new product for the same cost. With current methods, paper plants have little economic incentive to recycle because of the cost of the process. By lowering the cost, the new technique could enhance the recycling incentive, says El-Shall. The benefits of increased paper recycling would extend beyond corporate profits to protecting the environment and reducing energy use, he added. A tonne of paper from recycled pulp saves at least 14 trees, according to the Environmental Protection Agency.